Vancouver Vogue: And so it begins.. 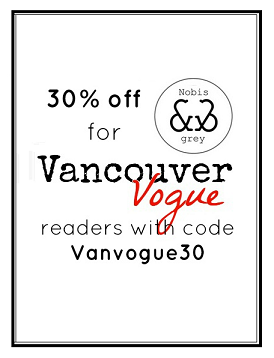 This marks my very first post here on my blog Vancouver Vogue! I have waited a long time to start this blog, to make sure that once I start I have the time to keep coming back every week. You can read more about me in my profile, but essentially I am a Business student majoring in Marketing, and dreaming of a career in fashion. I hope to post little inspirations to me, DIY projects, outfit photo shoots, my own personal designs, and MUCH more as time goes on! I will also try to keep you updated with local fashion events and chic and fun things to do in and around Vancouver. If you have something you wish me to write about or if there is something you would like to see here more often, please let me know! As I am just starting this adventure into the fashion blogging world, your suggestions are infinitely helpful and much encouraged. I look forward to hearing from many of you as time goes on, and wish everyone a fabulous week!